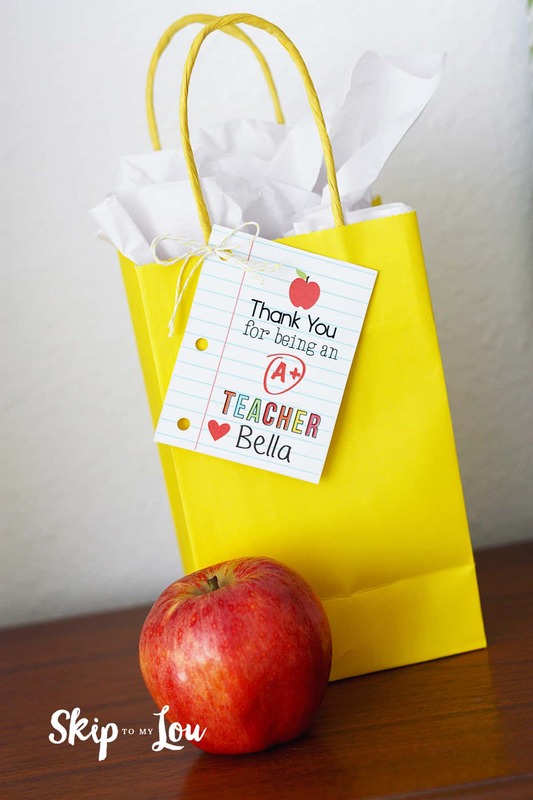 Thank you Teacher gift tags are the perfect note to attach to any gift. Teacher Appreciation Week is the first full week in May. Don’t miss this opportunity to say thank you to a teacher making a difference in a child’s life. These cute tags will make any gift extra special! I love celebrating teachers and there are loads more ideas on Skip to my Lou. 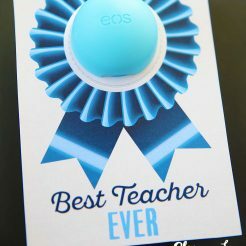 Be sure to check out all the teacher gifts. Teachers work hard to help little minds learn and are with them for many hours during the week! I’ve always wondered how these amazing teachers get through the day with 20 or more students in their class and I can barely handle 3 of my own at home. Do you know a teacher who could use a little extra pick me up or could use a reminder of how special they are to your child? 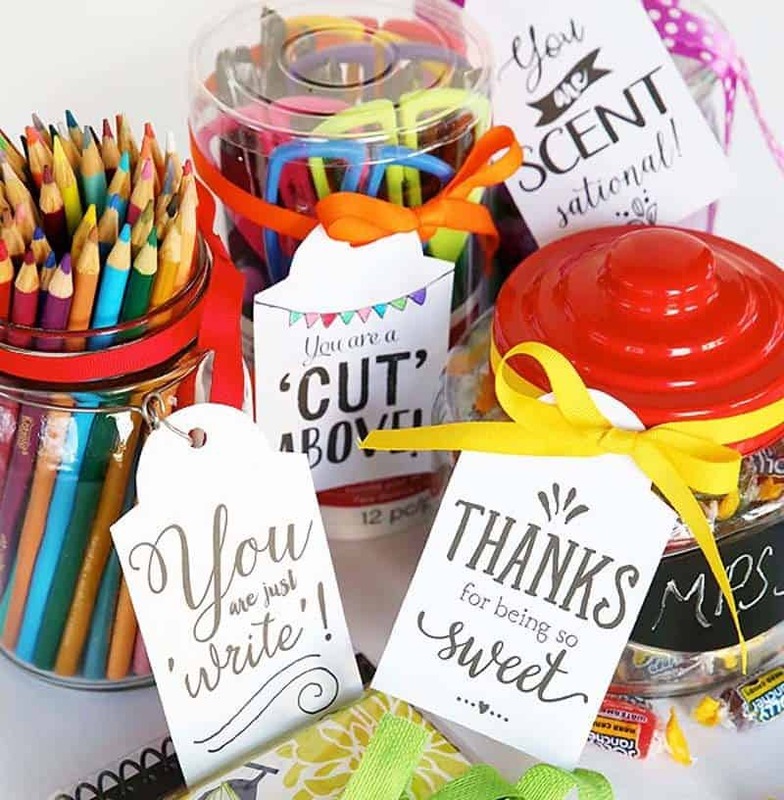 Teacher appreciation week is the first full week in May, and these adorable Thank You Teacher Gift Tags add the perfect touch to any gift. Add your child’s name to the bottom of the page next to the heart to give it a more personalized touch. These gift tags come 4 to a page and are best printed out on cardstock. Cut out the gift tags, and add 3 hole punches to the left side of the line to create the look of a mini version of college ruled paper. Thread string through the top hole and attach it to a gift bag, a wrapped present, or tie it around an unwrapped gift and you’ve got the perfect Teacher Gift! Behind the Design:Megan is the owner and creator behindShort Stop Designs. Graphic design is her creative outlet and she loves sharing her designs with others who need something new to spice up their home or are in search of a cute printable to go along with a gift. Aside from keeping up with her blog, her 3 active children keep her busy all while trying to survive the life of an Army wife. 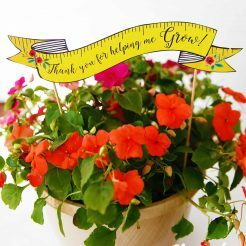 Looking for more easy ways to say Thank you teacher? I also have a set of 20 printable gifts that can be attached to a small gift. 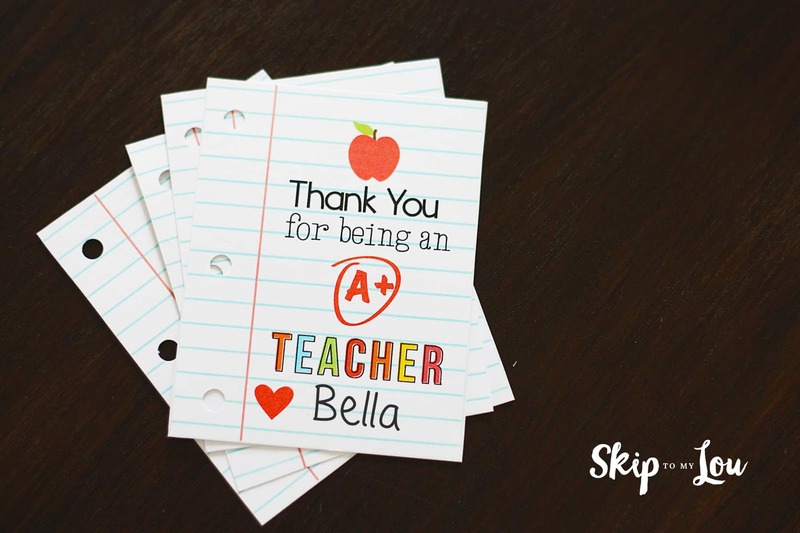 Download, print, cut and attach for an easy way to say thank you teacher! There are four of the same designs on each page in case you have more than one teacher to thank. 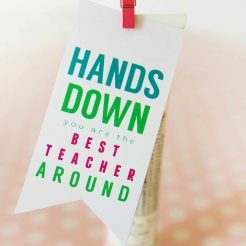 I hope you like these printable teacher gift tags. I hope all these ideas will help you say thank you, teacher! Hi, how do I go about getting this free printable (thanks for being an a+ teacher)? I can't figure it out. Hello Alicia, Click the link under the last picture of the cards. Let me know if it doesn't work. These are so adorable!! I need to do this for our kids - their teachers would think they were the cutest!